A necessary resource for any settlement is access to fresh water, and water was readily available in Sutton Coldfield, as a writer in 1762 observed: “In digging wells, after one or two shallow strata of mould, gravel, and clay, a hard sand, or crumbling sandstone is generally continued to a depth of 60 feet, which is the greatest depth we have occasion to go for water, but the depths are so variable that in some wells the springs are within five feet of the surface”. Generally the quality of the water was good, but there was always the danger of contamination - the late Dr. Clifford Parsons speculated that polluted water was the cause of death of the twelve fatalities in the village of Hill in 1671. The wells that were being dug in 1762 were of the traditional type, a deep hole lined with bricks with an appliance at the top to lower and raise a bucket to get water; every dwelling or group of dwellings had access to a well. They were steadily being replaced by pumps, a process given some urgency by a tragic occurrence in 1755. The Coroner called an inquest at the Three Tuns Hotel in Sutton to determine “how Mary Scotton and Elizabeth Lowe two children about three years old came to their deaths”; the verdict of the Jury at the inquest held on the following day, Wednesday 23rd April, was accidental death -“On Monday the 21st instant Mary Scotton and Elizabeth Lowe were found in a well in a croft belonging to Thomas Scotton, the said well being about two yards deep”. Some of the wells in Sutton were of a different kind. At Rowtons Well in Sutton Park spring water bubbles up into a wide artificial basin, and the two other noted wells in Sutton Park, Keepers Well and Druids Well, are also natural spring waters which fed into a basin (now vandalised). Sometimes wells of this kind were thought to have healing powers, the one at Canwell was believed to be a holy well; it was dedicated to St. Winifred, and the district was named after it. Townwell Farm near Little Sutton was named after the nearby Little Sutton Town well, almost certainly a springfed basin - the 1561 court leet ordered that Nicholas Turner must not interfere with the flow of water there. Kendricks Well, a spring near the bend in Hillwood Road, was a landmark in 1824, giving its name to a very localised area; a succession of Kendricks lived in the nearby cottage for over a hundred years, but the well and the cottage no longer exist. 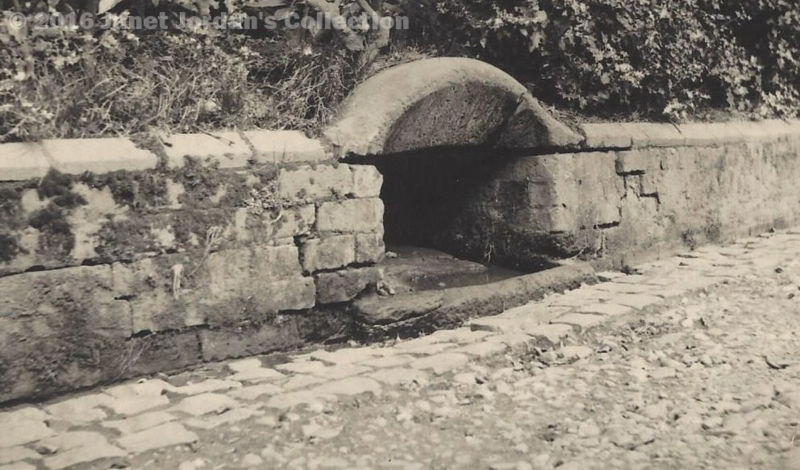 Belwell Lane is named after a spring-fed well; the surviving photo shows the well set into a wall and covered by a stone roof to keep pollution away. Maybe Sutton folk held annual well-dressing ceremonies at these wells such as still take place in some Derbyshire villages. A problem for the Friends of New Hall Mill when preparing the mill for its first open day was how to make the well secure. The previous miller, Ben Davis, would sometimes take water from the well to boil up for his tea, in spite of his cottage being connected to the mains, so the well with its unusual hollowed-out millstone cap was still open. Have a look at the well next time you visit (last open day this year is September 13th) to see how it was made safe. The old “Bell Well” in the wall almost opposite the entrance to Clarence Road. The photo was taken c.1924; subsequent road improvements mean that there is no trace of it today. (photo from the Keith Jordan Collection).